My name is Lee-Ann Cudmore and I am a registered acupuncturist, entrepreneur, busy Mama, and aspiring author. My goal is to inspire you to have a healthy and active lifestyle, so that you can live and feel better. 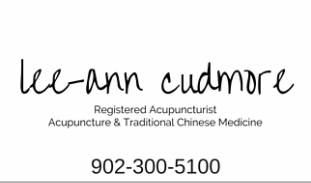 I have been practicing as an acupuncturist in Wolfville, Nova Scotia since 2007. I work in a beautiful clinic, which is fully accessible, scent free and has ample parking. The clinic, Wolfville Integrated Health Care, is a community oriented clinic that offers clients multiple therapies under one roof. As a registered acupuncturist, I specializes in neuro-anatomical acupuncture and electrical stimulation, in the treatment of myofascial and neurological pain, The style of acupuncture, merges modern technology, science and ancient wisdom in a treatment catered to a client's specific needs.